In Vietnam, the annual ritual of worshipping the dead often requires preparing for the altar two vases of flowers, votive money, wine, and most importantly, a plate of five types of fruit symbolizing the “fruits” from a year worth of labor. 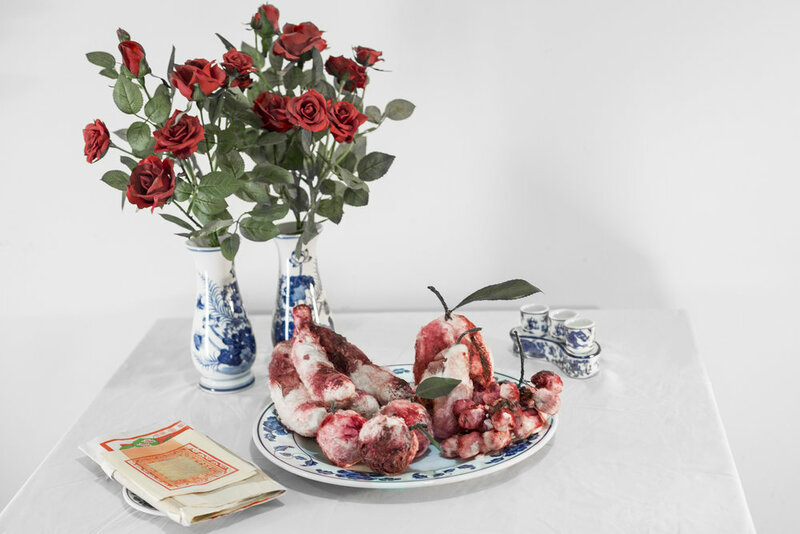 While this is a domestic task expected of a Vietnamese woman and one measure of her worth to the husband's family, these ceremonial ingredients are not to be touched by a female during her menstruation cycle since her body is considered tainted. Dear Ancestor is a subversive piece in which I molded these fruits out of tampons that had been dipped in artificial blood. I then arranged them among other ingredients as if they were ready to be served onto the altar for ceremony.